For nearly every driver, there are a few common maintenance tasks that a car will need regularly. Pretty much every driver knows (or should know) that your engine oil needs replacing about every 5,000 miles or every six months, whichever comes first. This, along with filter changes and brake inspections, is about as far as most people go with regular maintenance. There is, however, one more critically important aspect of vehicle upkeep that, because it requires less frequent attention, is often overlooked: your transmission fluid. Because transmission fluid is usually first added in the factory, most drivers have little to no relationship with what kind of fluid has been put in, what it really does, and when it needs to be changed. So, before you find out you’ve been ignoring a problem and suddenly need emergency transmission repair, sit back and learn a little something about why transmission fluid is so important, and how to make sure that it stays fully functional for your vehicle. What Is Transmission Fluid Anyway? Transmission fluid is a vital element toward your vehicle’s running smoothly. Specifically, it acts as a lubricant and a hydraulic fluid in modern automatic transmissions, facilitating easy transfer of energy between the transmission’s moving parts. When the torque converter’s impeller – which is powered by the engine – spins to move the turbine, the rotation is mitigated by transmission fluid, which absorbs some of the rotation and transfers it evenly to the axles. In order for your transmission to work properly, it can’t have any of its metal parts grinding against one another. Transmission fluid acts as a lubricant between the transmission’s moving parts to facilitate smooth operation without any damage to the gears themselves. 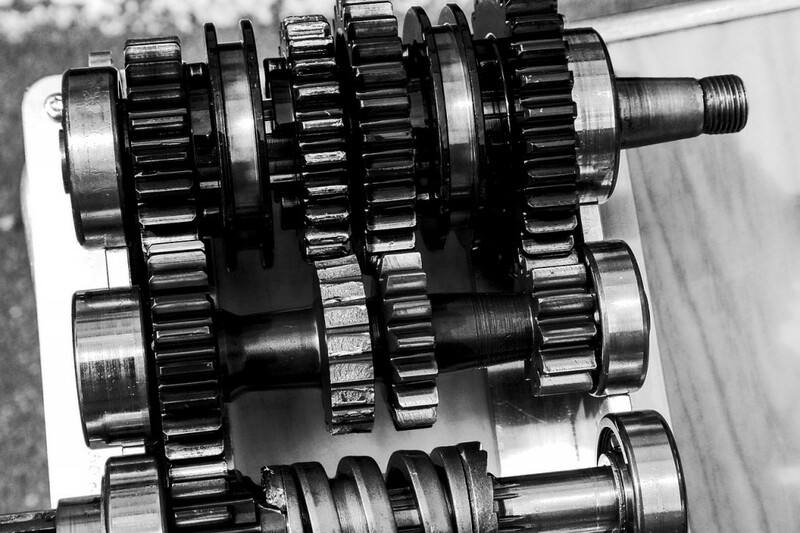 Otherwise, your transmission could be damaged by loose metal shavings and debris in between the gears. In the early days of the automotive industry, the primary lubricant found in transmission fluid was whale oil. This was a relatively inefficient system, however, since whale oil tended to break down under high heat. That, plus the moratorium put on whale oil in the early 1970s with the Environmental Protection Act forced automakers to find synthetic substitutes. This resulted in several different specific types of transmission fluid being produced, and each vehicle typically required the use of one specific type of fluid; still the system today, your car’s proper transmission fluid is likely listed in the owner’s manual. Typically, your owner’s manual will recommend that you change your transmission fluid every 30,000 miles, or often double or triple that. This is a controversial subject and has generated debate over when is the best marker for drivers to know to change their fluid, but the 30,000-mile marker is a fairly conservative estimation and probably isn’t a bad point to keep in mind. That being said, it’s important to recognize when your transmission fluid has developed a problem so that you can know to take immediate action. 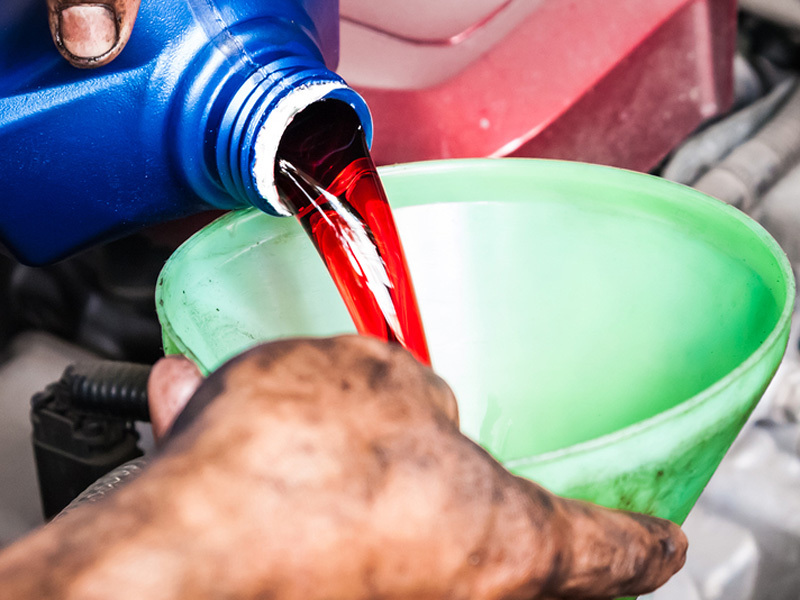 In many cases, this will be most evident through a change in color – most fresh transmission fluid tends to be colored red or green, to help distinguish it from typical engine oil. Check your transmission fluid dipstick located in your engine block by wiping it with a white rag while the car is running. If you notice that your fluid is a darker color than it should be, that could be a sign that your fluid has undergone too much overheating and has burned slightly, or that it has become contaminated with dirt or debris. In this instance, it’s best to drain your fluid and replace it as soon as possible. In most cases, you probably aren’t going to want to change your vehicle’s transmission fluid yourself. It’s a seriously messy job, and the person changing the fluid should expect to get dirty doing it. Although most transmissions come with a drip pan, this is not big enough to hold all of the fluid that will be flushed out, and so the old fluid will need to be collected and properly disposed of. It’s probably in your best interest to have your fluid changed by a professional mechanic who knows not only how to drain, refill, and reassemble your transmission but who also can dispose of the old fluid and acquire the right kind of replacement fluid. A mechanic will likely be more familiar with the different kinds of oil available and will know which one is right for your vehicle, minimizing the risk of a potentially transmission-destroying mistake. A mechanic may also be able to offer you a full transmission flush as opposed to a simple transmission drain. The difference here is in the quality of the changeover: in a transmission drain the mechanic relies on gravity to pull the old fluid out, but because of the physical mechanics of a transmission this typically only replaces about half of the old fluid at a time; a transmission flush, on the other hand, involves a special machine that pumps in new fluid while simultaneously extracting the old fluid. The difference between the two is that the flush can completely change over about 90 percent of your transmission fluid, much more than a simple drain. While this more labor-intensive method does tend to be more expensive, it offers a much more thorough job guaranteed to last longer, if done properly. Not every mechanic or manufacturer recommends transmission flushing, like Honda for example, which argues that flushing can leave harmful solvents and filter out vital additives that weaken your transmission fluid’s effectiveness and can do damage to your engine in the long run. 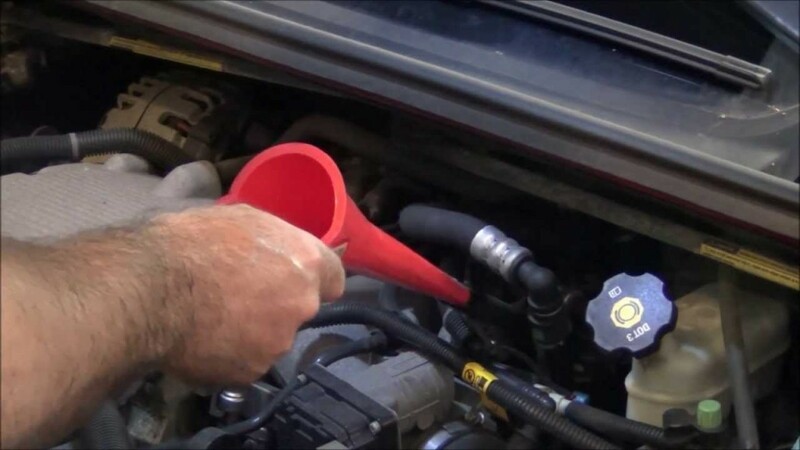 And, as with any procedure, it’s important to go through the process carefully with your mechanic to make sure he or she is using the correct type of fluid for your vehicle. So the best advice for choosing a transmission fluid is to leave it to a trusted mechanic. 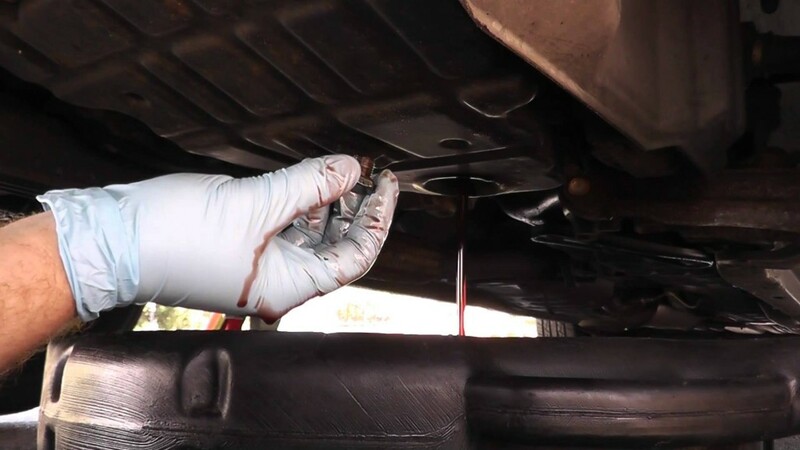 They’re trained and familiar with the different kinds available, and can likely help you sort out your new transmission fluid with no trouble at all. If you really feel like you can do it yourself, make sure to do plenty of research and be careful abut how you go about it – the transmission is the heart of your car, after all. Treat your transmission right, and your car will be successfully shifting gears for years to come.